This 8-1/4" 40 Tooth Trimming Blade is made of C3 micro ground carbide. 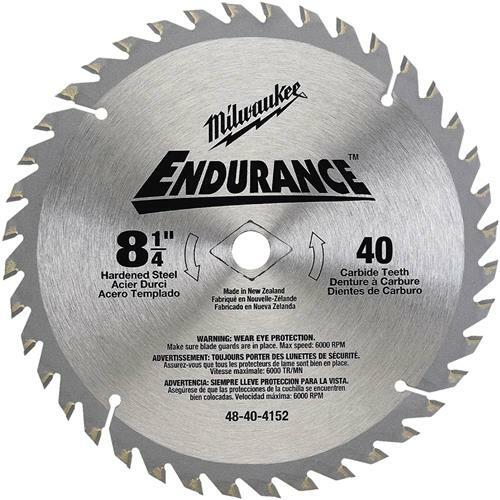 Endurance blade offers faster cutting and extra long life for contractors; hardened alloy steel body is used to ensure straight, accurate cuts. Features include a 5/8" arbor with diamond knockout, thin kerf for faster cutting and specially engineered heat vents and expansion slots that prevent blade distortion and increase blade life. Retains its cutting edge - a quality blade that contractors can depend on time and time again. Rip and crosscut blade.